Buchner Mfg. has built its reputation on providing quality materials and service. 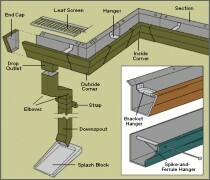 Offered are 5″; and 6″; eavestrough/gutter coils. The 5″; coil is available in 36 colours with our polar white on the back side of the 2 side painted coil. A wide range of eavestrough/gutter accessories is manufactured which include downpipes/leaders, hanger brackets, outlets, endcaps, gutter protection, sealants and fasteners.